Planning a Move to Arizona? Here are interesting facts about the life in the Sonoran Desert, enjoy! How big is the Sonoran Desert? Pretty big. The Sonoran desert spans parts of the American Southwest and Northern Mexico. It is the wettest, hottest, and most bio diverse desert in North America, where it occurs naturally in the states of California and Arizona in the USA, and Baja California, Sinaloa and Sonora in Mexico. The Sonoran Desert is bordered on the west by the Peninsular Ranges, on the east and on the north by the Colorado Plateau. Its total area across both countries is approximately 260,000 square kilometers, that’s over 100,000 square miles, with the biome’s largest concentration of flora and fauna being located in Mexico. What makes the Sonoran desert unique? In a word, saguaro, as in cacti. The Sonoran desert is the only natural habitat for this majestic plant. This giant cactus that can grow to 70 feet and live to be 150 years old. They bloom in the moonlight, when the gorgeous white flowers, actually the State flower of Arizona, are pollinated by bats. After blooming, their fruit develops, ripens, and falls to the ground to provide food for desert tortoise and other wildlife, which in turn help spread their seed. When a saguaro is injured, it creates a hard, wood-like scab over the wound, which often becomes the home of a bird like the cleaver and inquisitive Cactus Wren… one of the most friendly birds in the desert. This cacti home becomes a safe haven from predators as it is high above the desert floor and covered in prickly spines. If you need help finding your safe haven in the Sonoran Desert, be sure to give us a call, we will be more than happy to help you find a home for sale in Arizona. How Hot is the Sonoran Desert? Hot and getting hotter. Know as North America’s hottest desert, the temperature of the Sonoran desert can be rather warm, but it varies during the seasons, and is changing as you read this. The maximum temperatures are the killers, particularly in July and August. 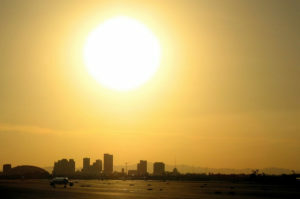 Phoenix (the areas largest metropolitan city) has recorded 122 degrees Fahrenheit! But normally a summer maxes out at 115-118 degrees, and those highs only last a few days. Usually summer days are around 100-105 degrees, with the nights “cooling off” to the 90s… sounds hot, but once acclimated you get use to it. Winters are the reason everyone loves living in the Sonoran Desert. They are long, pleasant, and rarely have snow. Daytime winter temperatures are in the 60s and 70s, sometimes dipping below that for a few short weeks. Winter nights are usually in the 40s, can be below freezing and because the air is so dry you will feel the cold in your bones. The climate of the Sonoran desert can be described as hot and dry/wet. With 3 to 20 inches (76mm to 500mm) of rain per year, the Sonoran desert is one of the wettest deserts in North America. Most of the year, the Sonoran Desert is very dry as the rain is condensed to just two rainy seasons, one in the summer and another in the winter. Traditionally the summer rains were called monsoons, which was defined as a seasonal reversing wind accompanied by corresponding changes in precipitation, but today the word “monsoon” is used to describe seasonal changes in atmospheric circulation and precipitation associa ted with the asymmetric heating of land and sea or “climate change” to those that know science to be real. 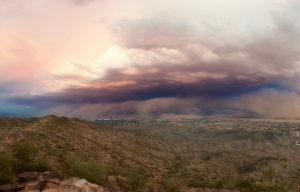 So the people of the Sonoran desert often call the summer rains dust storms, or “haboob” or even “relief”! The Sonoran Desert is covered with normally dry washes, which look like dried up riverbeds, called arroyos. During the intense summer rains, the ground quickly becomes saturated and a deluge of water begin to collect in the mountains and valleys, running towards and then down these washes. The washes serve a great purpose in allowing the rains to soak into and recharge the underground aquifers of the desert. The rain could me falling miles away; you might not see a cloud in the sky, when all of a sudden a wall of water will come flowing down a wash. It’s important to be mindful of this when hiking or riding in a wash during the rainy season. And never camp in a wash, no matter how invitingly flat and smooth it looks. You also need to watch road conditions what once was safe to cross could turn deadly in minutes. What about the poor animals! How do they survive the heat? Rather nicely. The Sonoran Desert is home to about 100 species of reptiles, 20 amphibians, over 350 types of birds, and 60 mammals. The different animals of the Sonoran Desert have created special survival techniques to combat the heat and long periods of dry weather. For example, Bighorn Sheep can obtain moisture from using their horns to smash the spiny exterior of a barrel cactus and eat the moist pulp inside. Desert rodents, like the Kangaroo and Pack Rat obtain adequate water from their diets of dry seeds. To reduce water loss, they have no sweat glands and produce urine that is twice as concentrated as seawater and feces that are 5 times drier than a lab rat’s droppings. The Spadefoot Toad can hibernate for up to 9 months a year. This amphibian digs a burrow underground and uses a slimy substance to cover themselves to prevent dehydration during their hibernation period. Then, during the summer rainy season, they emerge at night to eat, drink, and mate before going to sleep some more. Call us if you would like to find a basement home for sale in the Sonoran Desert to escape the heat. The Roadrunner, a stealth predator of snakes and small rodents, is found living in the Sonoran Desert. Despite being able to fly, this particular bird prefers to stay on the ground because it saves energy and it is less stressful. As depicted in the cartoon, Roadrunners are smart and can run very fast, reaching speeds as high as 40 kilometers per hour. But no one has ever really heard them say “beep beep”. The majority of Sonoran Desert wildlife is more active in the early mornings, evenings, and at night when the weather is cooler. During the day they will seek shade under trees, vegetation, rocks and other structures. Most animals of the Sonoran Desert are able to utilize and store water efficiently. Some interesting animals found in the Sonoran Desert include the White-Throated Woodrat, Turkey Vulture, Tarantula, Ringtail, Pepsis Wasp, Palo Verde Beetle, Mule Deer, Kangaroo Rat, Javelina, Jackrabbit, Harris Hawk, Harris Antelope, Ground Squirrel, Great Horned Owl, Gray Fox, Gila Woodpecker, Gila Monster, Quail, Elf Owl, Diamondback Rattlesnake, Desert Tortoise, Desert Centipede, Coyote, Collared Lizard, Cactus Wren, Bobcat, Bark Scorpion and Hummingbirds. And How Do Native Plants of the Sonoran Desert Survive? Very well, thank you. And if you’ve ever studied the flower of a cacti, you will have a grasp of how splendidly beautiful the desert can be. There are over 2000 native plants species in the Sonoran Desert which have adapted and evolved over time to survive the harsh climate and natural predators by “learning” how to seek and conserve water, as well as protect themselves. Many desert plants have green bark, which is used like a leaf for photosynthesis when the air it too hot and dry for an actual leaf to be out. When there is enough moisture for desert plants to leaf, the leaves are small rather than broad; this reduced surface area cuts down on water lost through evaporation. Desert trees that are able to leaf year round like the Palo Verde, Desert Ironwood, and Mesquite, provide much needed shade to other plants and animals. These are often called “nurse” tree, as only under their protection can baby plants survive the hot desert sun. Plants of the Sonoran Desert have extensive root systems, which spread near the desert’s surface to quickly obtain and store water when it is available. For example, the roots of a 2-foot tall Cholla cactus may spread out up to 10 feet in every direction. Cacti are photosynthetic just like other plants, meaning they use the sun for energy to grow. The body of a cactus actually swells in times of moisture and stores the needed water for later. In times of drought, the body sinks in, or contracts as the stores are used to survive. The most distinct part of a cactus is its spines. Because regular leaves don’t conserve water well, the cactus developed these modified leaves to adapt to its extremely dry environment. The spines are better at conserving water and surviving in hot temperatures regular leaves. Spines actually collect moisture from the air and let it drip down to the roots of the cactus. Also, spines are used to ward off predators and do provide the plant with a bit of shade. Many who buy a home in the Sonoran Desert use a style of landscaping called Xeriscape, which utilizes native plants hence requires little or no watering or other maintenance to look natural and beautiful all year long. The formation of the Sonoran Desert consists mainly of metamorphic, igneous, and sedimentary rocks with some of them as old as 2 billion years. There were a lot of active volcanoes in the desert about 20 to 40 million years ago which led to cinder cones, lava vents and large calderas. Precambrian outcropping are believed to be around 2 billion years old. To some extent, the mountain ranges of the Sonoran Desert run parallel to these outcroppings, with the mountain peaks of Mount Kofa and Mount Catalina reaching a height of 10,000 feet (3,048 meters). Temperature in the Sonoran Desert vary do to its different precipitous topography. An unknown number of aquifers and underground rivers transverse the Sonoran Desert in the U.S. and Mexico. Groundwater on both sides is used for agriculture, irrigation, and cities. Above article is a summary and description of the Sonoran Desert as well as important facts about the formation, age, climate, animals, plants and temperature of the Sonoran Desert. If you are looking to buy a home in Arizona, and want to see some of the beauty of the Sonoran Desert, call us at Sonoran Sky Real Estate. We will be happy to show you around! The Sonoran Desert is a unique and beautiful place to live, and the Scottsdale area is lucky enough to be surrounded by its beauty. If you’re interested in buying a home located in the beautiful Sonoran Desert, contact us at Sonoran Sky Real Estate, your Scottsdale area real estate experts for more information.